Find out who else is confirmed for the Cornish surf and music festival this year. The second wave of acts have been announced for Boardmasters 2017. 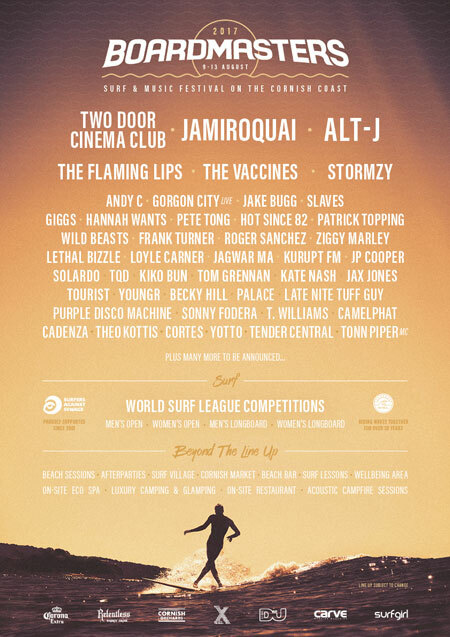 The Flaming Lips, The Vaccines and Frank Turner are among the 29 new names confirmed for the surf and music festival, which takes place on the Cornish coast from 9-13 August. The acts join previously announced headliners Two Door Cinema Club, Alt-J and Jamiroquai. The first wave of acts playing Boardmasters 2017 has arrived, including all Main Stage headliners & more! The Northern Irish trio will play Friday night of the festival, while Space Cowboy Jamiroquai will be bringing his brand of funk to Watergate Bay on Saturday. Mercury Prize-winning, GRAMMY-nominated three-piece Alt-J will then close the Sunday night of the festival. The likes of Jake Bugg, Slaves, Wild Beasts and Kate Nash have also been confirmed for the five-day event.